Catholic Workers and Veterans for Peace held an alternative Armistice Day event on Friday 11 November starting at the Occupy LSX site at St Paul’s Cathedral and concluding at the Bank of England. The ceremony outside the bank included naming the war dead in Afghanistan both civilian and military, anti-war ballads, reflections on war and its links with finance and bankers, reflections from the scriptures on nonviolent resistance, thoughts on the victims of war including the war vets who are abandoned on their return to civilian life and those who are targeted for speaking out against the wars. Britian passes its ten year mark in the war on Afghanistan, a war that has never had any popular support and presently has no end in sight. This year’s Armistice Day 11/11/11 was hyped by the media into a compulsory red poppy wearing day as a form of loyalty oath to the war without end. Compulsory for all those in public life. The wearing of the red poppy may have begun as a “Never Again” sentiment, but the government has attempted to hijack it as a recruiting tool in these long years of war. Footballers had the red poppy sewn into their jersies; the international friendly against Spain was transformed into an electronic Nuremberg Rally by the television conglomerates. All those appearing on Sky and BBC had to wear a red poppy. The compulsory nature of this act points to a token sentimentalism of the ruling elites and functionaries in relation to the young men and women they have sent to kill and be killed in Iraq and Aghanistan over the past decade. As Phil Berrigan once remarked to me “Sentimentality is not love!” Love of those slain in previous wars would bring an end to the wars in which we are now engaged. Rather we are left with once a year tokenism, sentimentality, a government that can’t break from the daily grind of bombing, kidnappings, torture and execution and a public largely disengaged and resigned to war as the background muzac to their daily lives. Catholic Worker and Veterans for Peace have been around and about the Occupy London site, located at the historic St. Paul’s Cathedral, for the past month advocating solidarity for war resisters Michael Lyons imprisoned in Colchester, Bradley Manning in chains in Leavenworth and Julian Assange electronically tagged and all but hogtied for deportation and eventual rendition to a U.S. gulag. 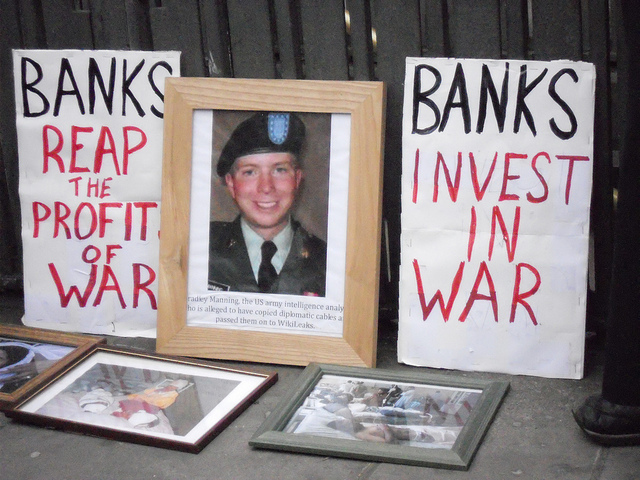 On Nov 11th, 25 of us gathered on the steps of St. Paul’s behind a banner “Mourn the Dead! Heal the Wounded! End the Wars!”. Our number included three veterans: Jim Radford of WW2, Matthew Horne of Iraq and Ben Griffin of Iraq and Afghanistan. We made our way in single file through the financial district and gathered once again outside the Bank of England. Fr. Martin Newell of the Catholic Worker’s Giuseppe Conlon House, an economist by training, welcomed us and explained the relevance of the locale. The banks and bankers of this area finance wars and reap the profits of war. They need to be confronted on this day and every day the killing and dying goes on. Both British military and Afghan civilians. Jim Radford sang the anti-war ballad The Band Played Watzing Maltida. Former anti-war prisoner of the U.S. Ciaron O’Reilly spoke of the nonviolent resistance in the U.S. military during the first Gulf War, the resistance of Michael Lyons who had been released from Colchester military prison this past week at the conclusion of serving a sentence for refusing to deploy to Afghanistan. Michael had made this decision after being exposed to footage and cables circulated by WikiLeaks. Ciaron called for solidarity with Julian Assange and Bradley Manning still in the sights of the U.S. military. Original report with photos here. Report by Veterans for Peace here. This entry was posted in Assange, Lyons, Manning, Reports and tagged Afghanistan, anti-militarism, anti-war, Armistice Day, Bradley Manning, Catholic Worker, Iraq, Julian Assange, London, Michael Lyons, Occupy!, Phil Berrigan, poppies, Remembrance Day, The Band Played Waltzing Matilda, Veterans for Peace, vigil. Bookmark the permalink.